Richie Krebbs is an ex-cop, a walking encyclopedia of crime and criminals who chafes at bureaucracy. Frank Robey quit the FBI and joined the Detroit PD, obsessed with the case of a missing child and unwilling to leave the city before she was found. When Richie unearths a possible clue in one of Detroit's many abandoned homes, it puts him on a collision course with Frank -- and with depths of depravity neither man could have imagined. How do people who dwell in the darkest places -- by profession or predilection -- maintain their connection to the world of light and humanity? Richie and Frank will need every coping mechanism at their disposal to survive their descent into darkness and emerge unbroken on the other side. 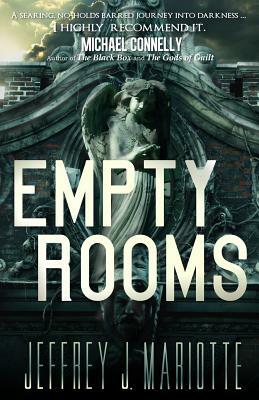 With Empty Rooms, bestselling award-winning novelist Jeffrey J. Mariotte introduces crime savant Krebbs and obsessive comic book fan Robey, who will quickly join the ranks of the most beloved heroes of thriller literature.